I think the Plantronics CT14 was worth the wait! I just got one and tested it at home. It is very similar to the prior model CT12 except for one big difference. The CT14 is on the new 1.9GHz frequency so it won’t interfere with your wireless router. The old CT12 operated on 2.4GHz and it always knocked me off line since my Belkin wireless router is also on 2.4GHz. This one gives me no problems whatsoever since the 1.9GHz frequency is forever protected by the FCC as a frequency for voice only. As for functionality it is very easy to use. The range is 300 feet (the length of a football field) which is double the range of the predecessor model CT12. It has caller ID, volume control, redial, memory, etc. The battery time is also much improved. It will go all day without needing to be recharged, even if you are on the phone non-stop for the entire day. It’s convertible so it comes with both the headset and ear hook. Wear it in either style or switch off just to mix things up. One other note. If you happen to work in an office that has the Lucent Partner phones (also called Avaya Partner or AT&T Partner, depending on how long ago you bought the phone system), you can use the CT14. You would just plug it into the bottom of the phone in the AUX (auxiliary) port. Although the CT14 is a single-line phone when plugged directly into a headset jack, it acts like a multi-line phone when plugged into your Partner phone AUX port. It will mirror whatever line you have pressed down on the phone. 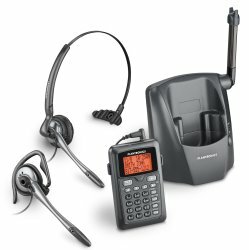 Now that the Plantronics CT14 is finally in stock you can it shipped right out by ordering online, click here.